From ancient times, the ancestors of the Witch have cast spells to protect their homes and families from spiritual, as well as physical harm. 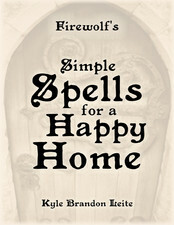 In these pages Firewolf (Kyle Brandon Leite) presents a delightful collection of charms and spells associated with the Home; including simple techniques and a few simple Spells for Protecting the Home, Ridding away Evil Energies, Cleansing and Blessing the Home, and a few powerful Magickal Recipes. Learn Herbal Lore and Charms; to Bless and Protect the Home, How to Create a Magickal Home Altar, any a few spells to attract blessings, abundance, and tranquility to one's home!